It’s only a week after Gallifrey One, but there’s no rest for the wicked as we bring you a very special announcement regarding Radio Free Skaro and the Calgary Comic & Entertainment Expo, taking place – surprise, surprise – in Calgary, Alberta from April 26-28! Event coordinator Shane Turgeon from Calgary Expo drops by with all the details including some exciting Doctor Who-related announcements. But wait, there’s more! As you may have noticed, the Three Who Rule let the news pass by the wayside during Gallifrey One, but there were so many interesting developments to discuss that a bumper list of news new and old is presented here for you to bring some sense of completion to your lives (but mostly to those of the Three Who Rule). Hooray! Note: this episode was recorded before we heard the sad news of the passing of Dalek designer Ray Cusick. We will feature a short memorial to Cusick in our next episode. Radio Free Skaro #355 – Click here to listen! – The Ice Warriors…are back! – Jenna-Louise Coleman…Talks About Her Future! – Steven Moffat…Talks 50th Anniversary Stuff! – Doctor Who Christmas Special…2013! – Reece Leatham…is Patrick Troughton! – Jamie Glover…is William Russell! 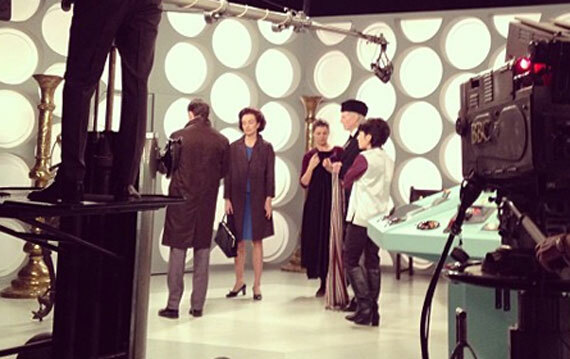 – Jemma Powell…is Jacqueline Hill! – Sarah Winter…is Delia Derbyshire! – Lesley Manville…is Heather Hartnell! – David Annen…is Peter Brachacki! – Nick Briggs…is Peter Hawkins! – The Second Doctor Revisited…on BBC America! – The Tenth Planet, Part Four…animated! – The Visitation Special Edition…coming May 14! – K-9 on North American DVD…coming May 7! – Doctor Who Confidential…voted best BBC Three show! – The Mind of Evil…at the BFI! – The Robots of Death…at the BFI! – Murray Gold wins…a fictitious award! Join Charlie McDonnell of Trock band Chameleon Circuit fame as he visits the set of A Christmas Carol along with the Doctor Who Confidential crew for a four-part series that aired on the BBC Red Button service.